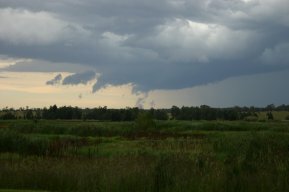 This photo was taken from Tenambit looking east at 5:56pm and shows the wall cloud formation. Severe thunderstorms this afternoon were reported in the Lower Hunter and parts of the Upper Hunter. The storms produced hailstones 4cm in diameter. The most notable thunderstorm hit the Raymond Terrace/Williamtown area between 5 - 6pm with 3.5cm average hail reported from Raymond Terrace and 4cm from Heatherbrae. A maximum wind gust of 93km/h was recorded at Williamtown's Automatic Weather Station. Further more, this same storm cell produced a wall cloud that could be noticed from as far away as Maitland. Wall clouds typically form at the back end of the storm and are usually associated with the development of tornadoes.